Accelerated Mobile Pages (AMP), a simple and elegant solution that can streamline the information much faster without all the extra baggage that a typical website has. It loads instantly and dramatically improves the performance of the mobile sites. AMP is an open source initiative build in collaboration with many different partners. AMP is just like a normal HTML website with a couple of restrictions on the extra baggage. So let’s implement AMP on WordPress. 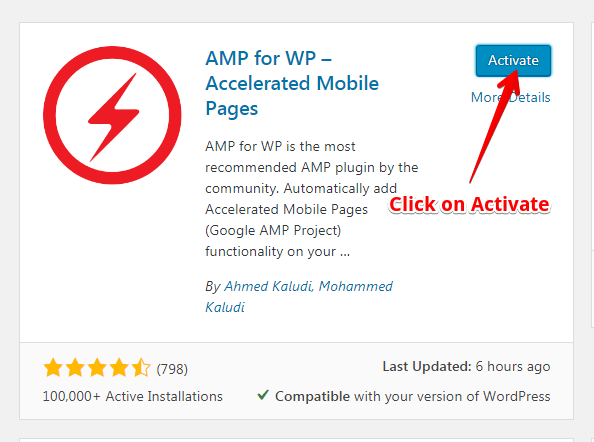 Login to WordPress Admin option panel –> Plugins –> Add New –> Search for “Accelerated Mobile Pages” (By Ahmed Kaludi, Mohammed Kaludi) –> Click Install –> Click Activate. Accelerated Mobile Pages is successfully activated. Click Here to download Accelerated Mobile Pages Plugin by Kaludi Brothers. Login to WordPress Admin option panel –> Plugins –> Add New –> Upload Plugin –> Choose file (Navigate to your Downloads folder then Select Downloaded zip file) –> Install Now –> Activate. Login to WordPress Admin panel –> Plugins –> Now Activate the uploaded plugins. 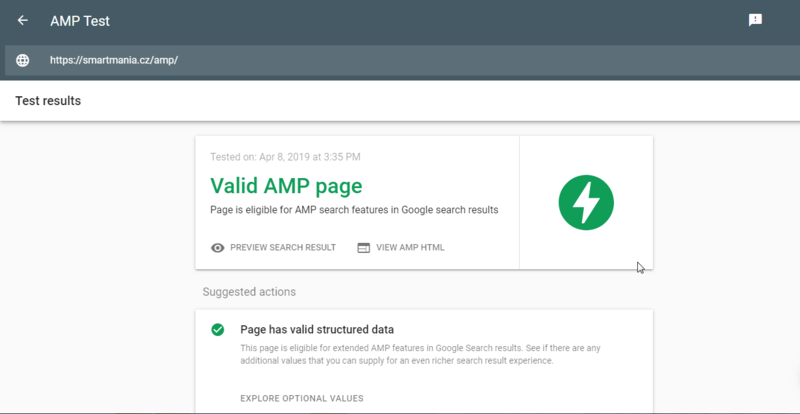 After activating the AMP, Google will automatically index the amp pages in the search console. If Google detects any error in your AMP page, that page won’t be visible or distributed in the Google search result(In mobile). There are Three different methods for checking AMP error on Website. This is official Amp Test website you can check this AMP page. Enter your URL to test this AMP page valid or not. After URL you need to enter /amp. Click on test URL button. If this URL is an AMP page it will show the message valid AMP page. This is official website ampproject AMP Validator you can individually check this page is AMP or not. Enter URL for eg. (example.com/amp) after that click on validate button. if this page is AMP it will give validation status pass otherwise fail. After URL /amp is mandatory to write. 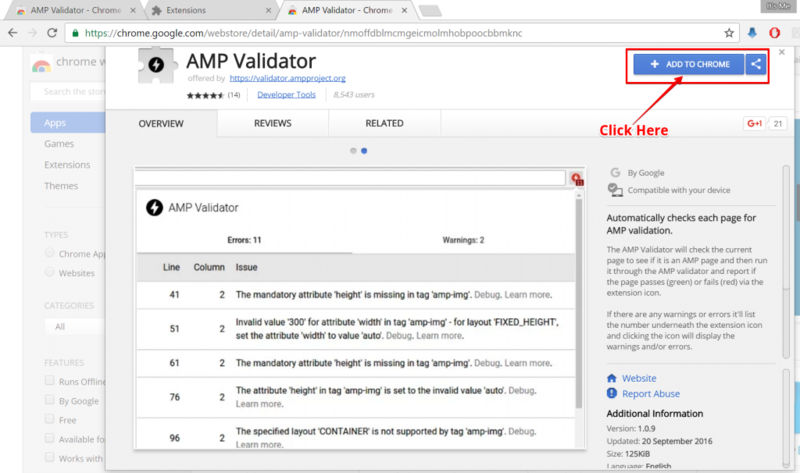 The AMP chrome extension automatically scans for the validation errors and will notify you when you are on amp page. Now Open your AMP-Activated Website, Check AMP chrome extension on Top Right Side. This page is valid it will show Green color . If in this page have an error it will show Red color. I decided to test the loading speed of one of the AMP enabled pages and compare it with AMP and NON-AMP. We have chosen a site one is non amp and second is amp we are compare same site.We tested this site on Gtmetrix.com. gets a standard loading speed of 4.3 seconds, But with AMP the page is loaded 3.8 Seconds. Almost 10x less the loading speed of Non-AMP Page. 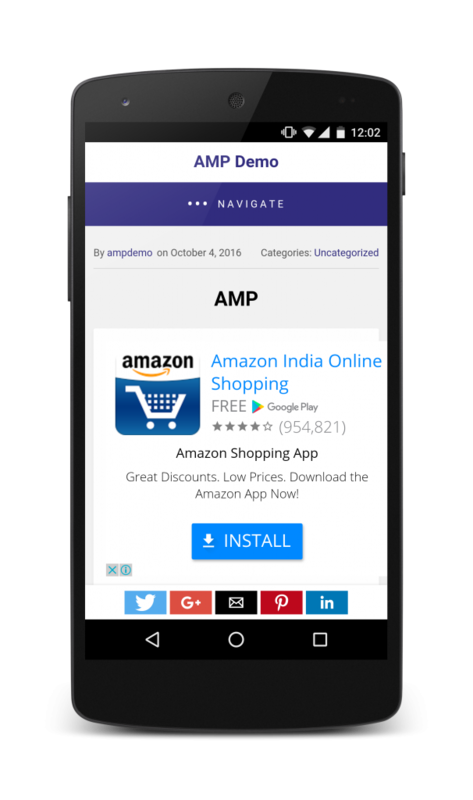 Now google allows you to place Advertisements in AMP page. Login to WordPress Admin panel –> Navigate to AMP option panel -> go to Settings -> General ->Advertisement Tab -> Select the size of Ad and paste the Publisher Id and Ad Slot Id to their respective fields. We have 6 Advertisement Positions if you want more Advertisement we have Ads for wp extension it’s a free extension. for more details of click on Advertisement. If you want more details click on Analytic. For more basic setup for Making other Required Changes click on Configuring AMP options / settings. Google AMP pages look kind of interesting because the AMP enabled pages to load 4x faster than standard pages. Integrating AMP on WordPress website is easy and it enables you to stay on top in all Search Engines, glean the rewards without any hard work. Allow AMP only on few posts or pages? And regarding your second question, we will add support for other ad providers as well in future updates. Thank you for sharing such an awesome information about AMP. There is very rare and true information about AMP on the internet. This will help me lot. For me is not working. I follow tutorial, but my blog http://www.espressocafe.ro/blog/?amp is blank page, nothing is showing. That is strange, can you please tell me which other plugins you are using with this one? I would be more than happy to help you and make your site AMP compatible. Thanks alot for this wonderful plugin. but please i noticed that at times the mobile redirect doesn’t work it still takes me to the desktop version. And then i will like to increase the number of post on the front page from 10 to about 15. Lastly it will be much better if the comment box is on the amp version instead of redirecting to the normal version. I will be very grateful if you can answer this questions . How about a tutorial on the Design section? or “Launch Page Builder”? all I see is raw css or html code, what am I to make of that? are we to hand write our html to build an amp version from scratch? Yes, David, that’s a good idea. Can you please let us know what are you trying to achieve? so that I can understand, it will help me improve the plugin and the user expectation. Hi, I’m looking (but haven’t found) an editor to create amp page. – include images, the barest formatting (color, background, horizontal lines) etc. Am I missing something, or is that something not quite ready yet? I haven’t gone ‘live’ with amp until I can make the pages look a little better (especially an image). Your AMP Plugin delivers more options than AMP Plugin By Automattic! I Have a question do I need to install Yoast glue plugin to validate this amp plugin of ours? Great to hear that you liked the plugin. You did not need to install Yoast glue plugin to validate or work with AMPforWP plugin. Our plugin validates more pages, has more compatibility and more control than any plugin out there in the market. I have downloaded and installed AMP, Accelerated Mobile Extension; and AMPWoocommerce and my product page will not display any of the products. Any ideas on why? They are currently deactivated so customers can see the products and add to the cart but I really need a mobile version. There are alot of factors, there mightbe conflict with other AMP plugins, make sure you have only one AMP (plus AMP from Automatic that we recommend). But if you could share your website url, so I can check what is the issue. Accelerated Mobile Pages (AMP) are an open-source initiative to provide web pages that load fast and look good on mobile devices, even over slow networks. Perhaps some time must go on before Google woruld detect any change? Yes, please give some time to google to crawl and index your AMP pages and then it will update the Google Console information. Which usually takes 5-15 days depending on the crawl rate of your site and how often you add new content. I’m sure your site will rock with AMP. Thank you very much Mohammed !!! I will wait for Mr Google !! Is there a way to stop these errors to show up in Google webmaster tools?